Introducing the BISSELL 34T2E Cleanview Pro Heat Carpet Cleaner The 34T2E is part of Bissell's advanced home cleaning range giving you a machine that will deep clean your home with professional results. 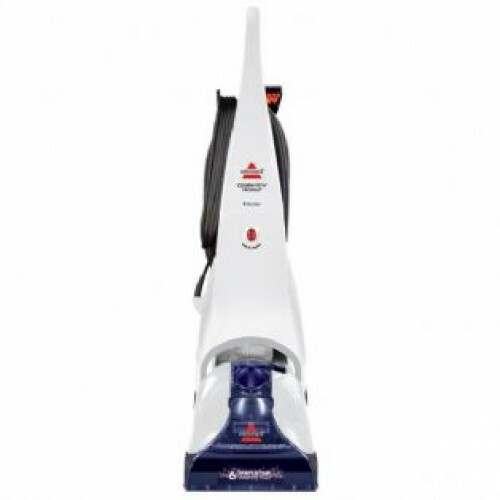 The Clean view Pro Heat includes many of Bissell's unique features such as Microban protection to fight against the growth of harmful common household bacteria; a patented heater to give optimum cleaning results and the Dirt Lifter rotating brushes with 6 rows of bristles which improves your home cleaning results by removing 45% of dirt left behind by ordinary vacuuming. With a ready tools dial allowing easy transformation from floor to above floor cleaning, the 34T2E makes home cleaning easier than ever before. Built-in Heater BISSELL CleanView® ProHeat® models all feature a patented built-in heater which will heat the hand hot tap water you put in it to safely optimise cleaning effectiveness. The heater will never allow the temperature to exceed 82°C degrees. The DirtLifterTM Powerbrush is designed to enhance cleaning performance. The bristle pattern safely lifts out the deep down dirt while gently grooming the carpet fibres. The floating suspension self-adjusts to all carpet heights. When the power is ON and the machine is in the upright position, your carpet is protected because the brush is lifted up off the carpet. ReadyTools® Dial The ReadyTools feature allows you to choose between FLOOR CLEANING or cleaning with TOOLS simply by turning the dial. The TOOLS setting allows for above floor cleaning of upholstery, stairs, crease along baseboards and other hard to reach areas. Simply choose the tool that is appropriate for the job, attach to flex hose and you are ready to go. Microban antibacterial protection is built into key components to help prevent the growth of harmful common household bacteria including E.Coli, Salmonella and Staph.a. It helps to keep the unit fresher and cleaner between uses.